A crowd of more than 600 pro-life advocates gathered Feb. 7 for the 16th annual Rose Day rally in the fourth floor House Chamber of the Oklahoma State Capitol. The annual event seeks to promote and support the sanctity of human life, with an express purpose of reaching legislators with a pro-life message. Introduced to the overflow crowd were 23 pro-life senators and 76 pro-life representatives. The crowd cheered and applauded when it was pointed out that more than 80 percent of Oklahoma’s state representatives are pro-life. Keynote speaker for the program, was Valeska Littlefield, organizer of the Life Network of Green Country in Tulsa, who grew up as a member of Tulsa, Berean. Littlefield had an abortion at the age of 18. She began volunteering at the Hope Pregnancy Centers in 1992, and has led post-abortion support groups for 10 years, including some in women’s prisons. “I am passionate about pro-life in that I believe women have been lied to,” Littlefield said. “They have been told abortion is a ticket to equality. My goal is to educate women about the truth and give them real choices. When they know the facts, they most often choose wisely anti-abortion. Pointing out that nearly 7,000 abortions are performed in Oklahoma each year, Littlefield implored those listening to support women they know who are considering abortion. Other Rose Day speakers included Rep. John Enns (R-Enid), who outlined the fallacies about the effectiveness of embryonic stem cell research; Sandra Williamson, wife of Rose Day emcee Sen. James Williamson (R-Tulsa), who has directed two crisis pregnancy centers; Cynthia Carney, state leader of Operation Outcry, who gave a personal testimony about the effects of abortion on her life; and Deanna Prufert, who told how when she saw her baby’s heart beating on an ultrasoud provided by an Oklahoma Baptist Homes for Children Hope Pregnancy Center convinced her not to abort her daughter, Abigail Ann, who is expected to be delivered April 10. 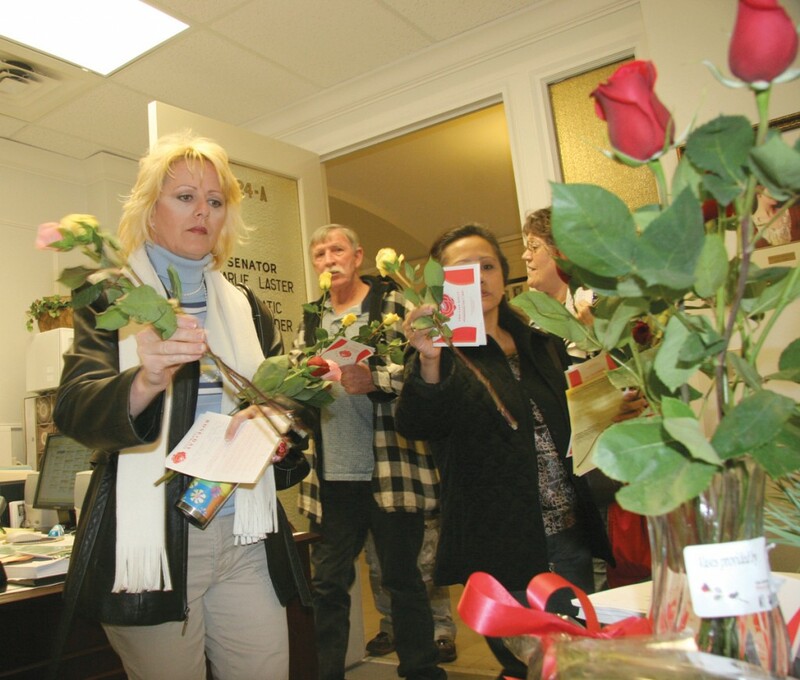 Prior to the program, Rose Day participants presented roses-as a symbol of the sanctity of life-to the offices of their state legislators and other elected officials. In 1992, Rose Day was established to give participants the opportunity to impact legislation by individually visiting their senator, representative and the governor in their respective offices, presenting them with a rose and encouraging them to protect the life of the unborn. In 1997, the CLC broadened Rose Day participation beyond Baptist ranks. It formed a Rose Day Steering Committee which included representatives from major Christian denominations, local Christian media and other groups. “Since then, Rose Day has become a multi-denominational event with Catholics, Assemblies of God, Nazarenes, Churches of Christ, Free Will Baptists and Southern Baptists joining together to plan and implement each year’s Rose Day event,” Wilburn said. EDITORIAL: You talked, we listened!